The fit of the jeans mirror the fit of high end brand jeans like Paige and Hudson Brand. Each university we carry has up to 5 pocket designs that are designed especially for each school! 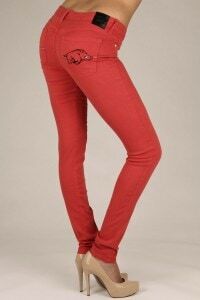 OCJ carries dark wash jeans in skinny and boot cut and also colored denim for 8 of our universities. These jeans will complete the perfect game day outfit and are comfortable enough to show your spirit elsewhere too! All of the denim jeans are $127, the colored jeans are $132. And here’s a special deal JUST for Lady and the Blog readers…20% off TODAY ONLY!! C’mon, get that last minute Christmas present today!! Simply enter the code “LadyandtheBlog” when you are checking out!! !